The Medieval Times encompass one of the most exciting periods in the History of England and Europe. The names of famous Kings scatter the Medieval History books and other historical documents. But behind every famous King of the Middle Ages was a Medieval Queen or Princess. Who were the wives of these famous Kings? Who were the queens or princesses who married the Middle Ages Kings of England? Which Queen or Princess married men such as William the Conqueror, Richard the Lionheart, King Henry II and King Edward III? Who were the women who ruled during the Hundred Years War between England and France? What were the names of the Medieval Queens and Princesses of of the Royal Houses of Lancaster and York during the Wars of the Roses? These Queens and Princesses shared the most powerful positions with their husbands and many held extremely important influence over their sons. The English Medieval Queens and Princesses of the Middle Ages cover the periods from 1066 - 1485. Interesting information, facts & the history about the Medieval Queens and Princesses of the Middle Ages. 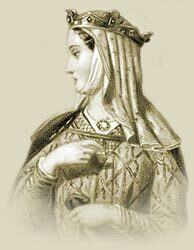 The following list of the most famous Medieval Queens and Princesses of the Middle Ages provides access to a brief summary of their lives. The defeat of Richard III at the Battle of Bosworth saw the emergence of a new era in English History - the Tudors starting with the man who claimed victory over Richard III - Henry Tudor who became King Henry VII on August 22, 1485. Interesting facts and information with a short biography about the Medieval Life, Times and history of Medieval Queens. Additional useful details, facts, history and information about the famous Medieval Queens of the Middle Ages and important events during their times can be accessed via the Medieval Times Sitemap.